In universe life is found only earth. The earth is a planet at which organisms will be live. Health is more important for life. All the organism live on the earth is necessary a good health for survive. Especially health is more important for human life. Without health human cannot do any work in the world. If we want to survive on the earth we must take care of our health. But in now a days people have no time to care our health. The bundles of the work make the human being busy and the human being have no time thought about his health. In old days people go for exercise in the morning but in now a days the new innovations of the science makes the human life easier but the human being become lazy. There the no of the plants present in the heart which will be very useful for human life and human health. These plants will be can be used by human being in the shape of fruits and vegetables. We can also use this herbs and plants in the medicine for the benefit of human life. There are the number of the vegetables which can be used in normal life but these are most necessary for human health. All the vegetables are necessary for human health because different vegetables have different benefits but we give a name of some vegetables carrots, garlic, tomato, ginger and many other vegetables. Garlic is the herb which will be used in normal life. The biological name of the garlic is Allium sativum. Garlic is a bulbous plant. It grows up to 1.2 m (4 ft.) in height. It produces hermaphrodite flowers. It is pollinated by bees and other insects. Garlic will become produce in wild areas. Garlic will be used to make food. The shape of the garlic is look like onion. The entire head of the garlic is called garlic bulb, the segment attached by the garlic is called Clove. Normally there are 8 to 12 cloves in single bulb. These clove are different in size. Garlic will be used in food to give and food flavor and also used in medicine to protect the human health from diseases. There many health benefits of garlic some benefits are given below. Here are some of the best and useful health benefits of garlic for you. Garlic is low in calories and very rich in Vitamin C, Vitamin B 6 and Manganese. It also contains trace amounts of various other nutrients. Garlic is the best natural medicine to control blood pressure. Eat 2 to 3 garlic clove twice a day. It helps to control your blood pressure and reduce joints pains. Eat garlic cloves daily is very useful to control high cholesterol level in you body. Garlic is very helpful to grow the hair. Rub sliced clove of the garlic on your scalp and you can also infuse oil with garlic and message it on your scalp. Garlic will be used to remove the pimple on your face. 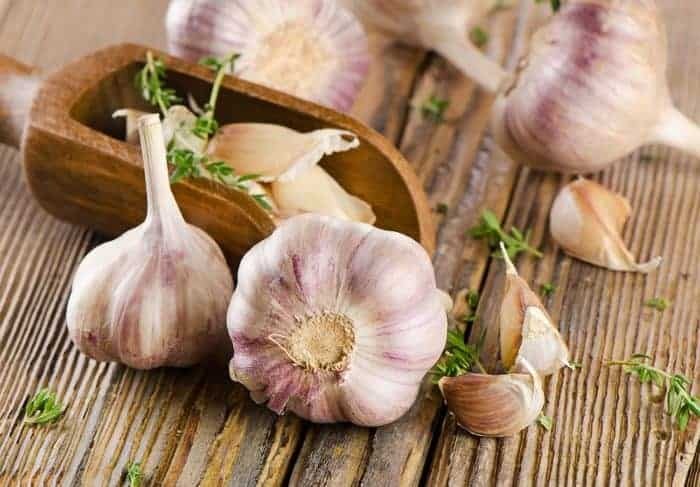 Rub the clove of the garlic on your pimple and the antioxidants in the garlic will killed the bacteria and pimple become remove. Garlic will be used as a medicine in cold and flu. By drinking sipping garlic tea the flu become end. Take garlic clove and chopped these cloves. Now put these chopped cloves in hot water and boil for several minute. After boiled you can strain this and drink. You can put a bit of honey and ginger to improve the taste of this tea. You can use garlic to take a smooth and rash free skin. Put 2 to 3 drops of garlic oil on the effected part of the skin and rub it. This make your skin smooth. Garlic have low calories you can use the garlic in your diet plan. It helps to control cholesterol level in your body. To take an advantage of try to cook with garlic daily. You can use a garlic on your foot due to its anti fungal properties. You can catch the fish by using garlic clove because the fish like the scent of garlic. Garlic can be used to make the medicines of the cancer. Garlic can be used to control diabetes. Garlic can regulates the blood sugar in the body and enhance the level of insulin in the body. Garlic can be used in skin infection. By applying the garlic cloves on the infected area. After some time wash with room temperature water. Take 2 garlic cloves and crush these garlic clove. Now take one cup of raw milk and put these garlic cloves in the milk. Let it sit for ten minutes and drink it an empty stomach. It helps you to lose the weight. These are the some health benefits of garlic are given above. I hope you like these tips and use for your health.